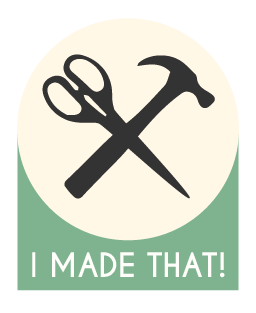 Thirty-Eight: Beeswax Wraps – I Made That! 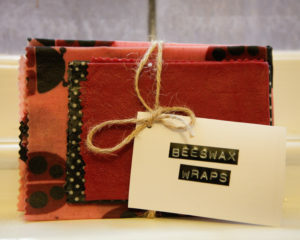 If you’ve explored the plastic free world at all, you’ve probably come across beeswax wraps. 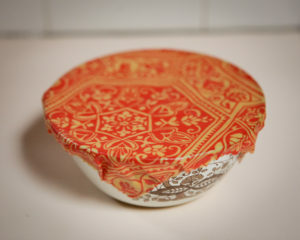 A replacement for cling wrap, they are made from thin cotton fabric and infused with melted wax to make a pliable, waterproof covering for food. The wax softens with the warmth of your hands and is then flexible and able to be moulded to your bowl. 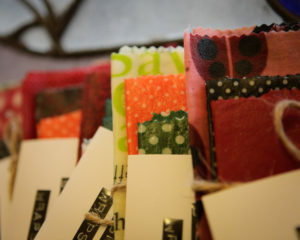 A few years back I made some beeswax wraps by grating beeswax (which I purchased online from an Apiarist) evenly over fabric squares (all scraps I had lying around at home) and melting it in the oven. 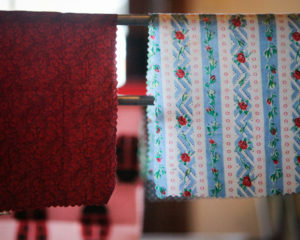 The wraps weren’t great, the wax became soft but lacked the cling factor (check out the method I followed here). After some more research I found that including a few other ingredients along with the wax was the trick…jojoba oil for some extra softness and pine rosin (resin from trees!) to add tackiness. Finding jojoba oil was no problem at all, I ordered it yonks ago when I made deodorant from the same online store. Pine rosin was harder to source! After some research I found that rosin is often used by dancers and gymnasts to create grip on slippery floors. So, I looked up a local dance store in Essendon and to my delight they stocked rosin, so I got to work. I found that my previous grate, spread, melt procedure meant that the three ingredients didn’t combine, leaving pools of wax, oil and rosin scattered across the fabric. 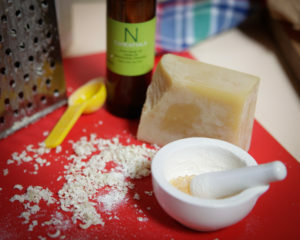 Some googling led me to a method where you used a double boiler to melt and mix the items together, then use an old pastry brush to paint the mixture on, pop in the oven on a tray to even the wax out and then hang up to dry. And apart from leaving a sticky residue on the bowl which has proven impossible to remove, it worked a treat!